Stretch Wrapping Machines manufactured, supplied and traded by our organization could be availed in the range such as Pallet Stretch Wrapping Machines and Box Stretch Wrapping Machines. These machines as per their name are used for wrapping. Banking on our pool of the experts, we are involved in the production of Box Stretch Wrapping Machines to the clients. 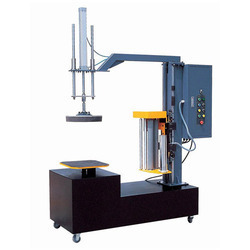 The excellent quality wrapping machines are available with us which adheres to the industry laid parameters. These machines are used for wrapping purposes. The efficiency of these wrapping machines could be easily recognized from the fact that these machines could wrap single or small cargos combined in the least amount of time.